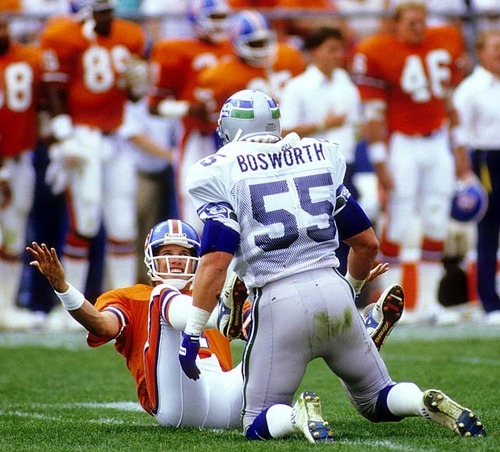 Brian Bosworth will forever be remembered as an outspoken and opinionated football player whose pro career ended far too soon. Today, he’s making movies like Revelation Road—with TNA wrestler Sting—out now on DVD. 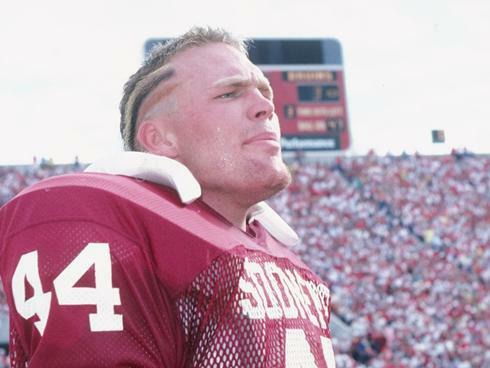 We caught up with “The Boz” to talk about movies, steroids, and the biggest problems facing the NFL and NCAA. Muscle & Fitness: Are you aware of how you’re remembered? Does it bother you that you’re often called a bust? 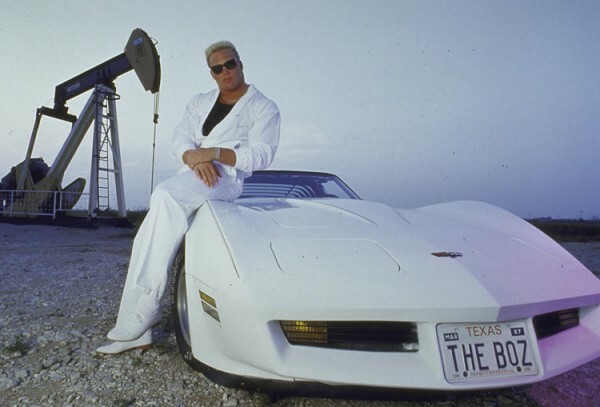 Brian Bosworth: Usually the people who are saying he’s a bust are people who have their own agenda, they either didn’t like me or had a preconceived notion of who I was. 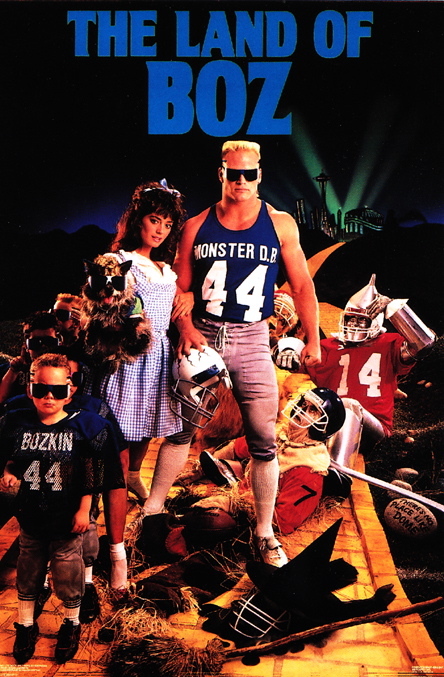 They didn’t like “The Boz”. I would be surprised if any of those guys have any knowledge of what a bust truly is. If you go back and chronologically look at the career that I had, albeit short, I came in late, came in at a different position than I had in college, played two games then went on strike for four weeks, came back played another seven or eight games, was defensive player of the game on a couple of different occasions. And under intense scrutiny and intense pressure, on a very old football team, still made the playoffs for the first time in seven years, was second on the team in tackles, and dislocated my shoulder against the Houston Oilers and continued to play on it anyway. 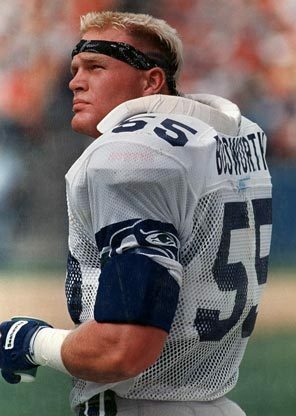 If anyone took the time to look back and see what really happened to Boz, what was the undoing of him physically as a football player—having all of those interruptions as a first-year player… when we went to the NY Jets to play my rookie year, it wasn’t the Seattle Seahawks against the Jets. It was Brian Bosworth. So it was a complete clown show. You’re talking to a kid who’s 22 years old and was raised in the atmosphere with his father who coached me when I was 8, 9 years old in the pup leagues—and I’m bleeding out of the eyes and ears, hurt, and your dad is screaming at you “You’re not hurt, get back out there!” You’re programmed to turn pain off. So I’m turning pain off and ignoring my body. I’m 75% at the beginning of the year, and my play diminished. They said, “Oh, he can hit the guy, but he doesn’t wrap him up.” Well, I can’t wrap anybody up because my shoulder doesn’t work. Are you going to define me as a bust based on the fact that I broke my shoulder? Bo Jackson is another great example. He pulls his hip out, and now he can’t run as fast, hit as hard, get around corners. If that had happened in his first or second year, they’d call him a bust, too. So they say, “Oh, well his injury caused him to have a joint replacement.” Well, guess what? I’ve got two joint replacements. This is something I went through in the love-hate relationship with the media and the love-hate relationship with God. People said, “Oh, he’s manipulating the media,” No. I was just being a kid. I cut my hair the way I did because my father never let me cut my hair. What the media loves to do is they love to build you up and then the first time you mess up, man, they will rip you to shreds. They couldn’t wait for me to fail, which really upsets me because that’s one thing I never ever wanted to do. I wanted to keep everybody happy, so much so that I put my own career in jeopardy for Seattle, the fans, the coaches, my teammates, and myself. I didn’t want to disappoint anybody. You’re sitting in the training room and this is what the coaches do. You’re on the team, and the coaches look in the training room and, (in an excited voice) “Hey, you ready to go today?” And you know you’re not ready to go today. You’re hurt and your shoulder is hurt and you’re just going to irritate it more and get beaten up. But they’ll give you this look like, “I can’t believe you. You’re really going to let me down? I can’t count on you? Thanks.” So that gets into a player’s confidence and you say, “Okay, shoot me up, tape me up, do what you have to do. It’s not like today. The guys are like, “If I ain’t right, I ain’t playing.” Because they’ve got so much money invested in the starters. If you don’t come in in the first two or three rounds, you don’t have any leverage. If you’re a sixth round pick, they’ll play you for two or three years because they can pay you a minimal salary. … and then do the same thing with the next group of guys. It’s a real revolving game. Sting attributes his longevity to quitting steroids in the early ‘90s. Do you feel the same way? I never really got into steroids. There’s another misconception, that I built myself up on steroids and kept myself there with steroids. I had a prescription (for an injury), just like every other athlete back in the 80s. I was freaked out by them because I just saw that there was this long-term damage that was going to happen. And they either came in a shoe box or out of the back of a gym, and at the same time, everybody was freaked out about AIDS, so I wasn’t going to get involved in anything I didn’t know anything about. And the one time I did get involved with them, it was when I went to a doctor, he said, “I can help you heal that injury,” so there was a specific reason I went to the doctor. And I had everything monitored. I got them through the doctor and I did everything the right way. And right at that time, that’s when the NCAA says, “This year, we’re testing.” Oh, okay. It wasn’t a thing where I said, “I need an edge.” It was part of the game, though. We all knew guys that were taking them, but to me they didn’t make you any faster, or hit any harder. It’s either inside you or it’s not inside you. It doesn’t make you a football player. The passion of being a football player makes you a football player. The passion of being a wrestler makes you a wrestler. Plus I was freaked out about it because I wanted to live. I personally didn’t choose to go that path because I didn’t need to be 270 to be a linebacker. I was good at 240. Yet I’m labeled as the guy who took steroids. The more you try to defend it, the more you’re guilty so I just let it go. What were some of your best lifts ever? My six-rep max in the clean was 315. I did that in high school. In college, they didn’t clean, so I was disappointed. A lot of my speed and explosiveness came from that. Knowing now what I didn’t know then, I would never lift the way I did back then. It was retarded. You don’t need to go in there and bench press 400 pounds. You need to be able to sustain your effort. 275 for 20 or 30 reps is more helpful. You’re never going to bench press one guy off your chest. You need to be able to do it over the course of a game. 405 on the bench was a big moment because you can have the three plates on there and a combination of the others and you’re fine, but once you’ve got the four plates on the bar, you look at it and go, “Oh, I ain’t getting that up.” So doing that was one of those moments. What do you train like now? Since I replaced both shoulders, I train three to four days a week, 45 minutes to an hour of aerobics, then circuit training—I’m the same weight now as I was when I played – 235 to 240, and I eat super clean now, especially now compared to the way I ate back then. I stay away from starch and gluten. I eat a lot of protein. I stay away from sweets. I get a cheat day once every couple of weeks. The food you eat is the fuel your body needs all day long. Stop eating cheeseburgers, brother. Robert Griffin III had a scary moment in the playoffs this year. He was playing on a clearly injured knee and made it worse. We still don’t know if he’ll ever be the same. When you saw that, were you relating it to your own situation? I was tweaking out. It’s a prime example of exactly what I’m talking about. They bring this young kid in—and the Redskins haven’t been relevant for years—the talent this kid has provided a big boost not just as a quarterback, but to rally the other players around so they start believing they belong in that position. And they know he’s hurt, but they’re willing to risk his entire career for a playoff game. They’ve got the doctor on the sideline, Dr. Andrews… and he’s there telling that kid, “Dude, you’ve got a torn tendon in your knee and I see the style that you play, the only way you’re effective and you can’t defend yourself, this is a recipe for disaster.” For [Coach Mike] Shanahan to sit there and watch that… like they didn’t see it coming. They knew it was happening and they just continued letting him destroy [his knee] and potentially ruin his career… We still don’t know the repercussions. He could come back out next year and be half as slow, not the same player, and then what are we going to say, “He’s a bust.”? It’s going to happen over and over. You can’t leave it to the player, because the player is always going to say, “You know what? I want to play.” Because all we want to do is play. I felt like I was Superman. I never felt like there was an injury I couldn’t overcome. The guys on the other side—they hate you as much as you hate them. And if you can’t defend yourself the same way as they can. They’re coming at you with a sword and a shield, and all you have is a sword. Your brain is telling you, “If I hit with that shoulder—or if I cut with that knee—I’m not going to be as effective. So as my year went on, that second year, I started adjusting my play. So instead of hitting everyone with my left shoulder, the one that was injured, I started hitting everyone with my right shoulder even though it would put me in a bad position, so then I ended up screwing up my right shoulder. You’re damned if you do and you’re damned if you don’t. So you have to take the player’s opinion out of the equation. The team has to come in and say, “What’s the best position for us and the player? We want him to be on the team long-term, so he can’t play.” And it also comes back to the league saying you can only have 53 men on the roster. There’s no way to win knowing that the owners are controlling the game and the players have to play by the owners’ rules. Do you feel like public opinion of the NCAA is reaching a breaking point where something will change? More and more people are starting to realize the absurdity of an industry worth billions where the workforce isn’t paid a dime, and if they exchange a hat or a helmet for a tattoo, they’re treated like criminals. Do you think we’ll see major reform anytime soon? I don’t think so. The universities and the university presidents have pooled together in these major conferences and the only thing they care about is the bottom dollar in the major conferences. Again, they’re not thinking about the player and what the player brings to the university. And I think back to my day, nobody was making posters at Oklahoma. They were pubbing me and they still do that. And I get a little bit upset about that because they use our image and the tradition of our image to promote and they never compensate the player. … I understand you can’t pay the players, but you’re taking kids from socio-economic backgrounds where they don’t have money when they get on campus. They can’t get a car. They can’t put gas in their cars. They can’t have fun and all their other friends are out having fun. It makes it really difficult to police that kind of institution. The players are going, “Wait. We won the BCS National Championship last year and my school brought in $18 million. What do I get? I don’t get anything.” So it develops this undercurrent of frustration for the players. So the players realize the NCAA doesn’t care about us. They just care about ratings and how they’re perceived. From the time I was a kid, I wanted to be an Oklahoma Sooner, and be relevant with them and win a championship with them. That was my dream. And that dream came true. So I’m not bitter at all. But I can certainly see where a lot of kids realize, “You know what? They’re taking advantage of us, so I’m not going to hang around four years and let them beat me up because I’m going to go make some money. What happens next year if I get hurt? My first- or second-round status may become fifth or sixth, or not get picked at all.” So they need to make some really difficult decisions. It’s screwed up. Who cares if you got a jersey for a tattoo? Is that really big in the big scheme of things? All my stuff was stolen the day I left. I didn’t get one helmet, one jersey, one pair of shoes. I didn’t get anything. But it’s all out there on eBay, so somebody bought it all. It would be easier if you earn a scholarship, get paid, get a certain amount of money every year that you make yourself eligible to play, meaning you have to go to class, but you get a little bit of money. And if you stay the full four or five years, they should get paid a little bit of money and if you stay the full four years and graduate with a degree. There should be a pool of money there so there’s something there, something to look forward to. There’s an incentive for a player to stay. So the teams should say, “We’re going to profit share with those kids if they graduate.” There should be profit-sharing, but that letter of intent is to stay four or five years later. Why did Revelation Road appeal to you? After reading the script and putting it down and reflecting on who the character (biker gang leader Hawg) was, I realized Hawg was me. He was full of vengefulness and hatred. He had his heart set against humanity. He had a grudge against God, which is ironic because I was looking for that kind of a wakeup call. So I took that as a signal to ask myself if I wanted to continue to be this type of person, or accept the test. That’s what God does to us on this journey called life. He tests us to find out if we’re worthy or not being able to come home. Because being able to come home is one of the three questions we ask ourselves as human beings. 1) Where are we from? 2) Where are we at? 3) Where are we going? And ultimately, if you want to go home, which is heaven, the only way to do it is by asking Jesus Christ to come into your life and be your savior. And since I was not in that position, I needed something to reflect a mirror image of who I was. I wasn’t a representative of Jesus Christ. It sounds like you had something of a journey doing this movie, then.